Dress Up Girl For Ballet is newest fashion design game for girls. Download Dress Up Girl For Ballet game app for free and start to make your best fashion story in top virtual fashion salon on your smartphone. Ballet is very popular sport for girls and boys who like to dance. We invite you to meet our ballet girl, and help her to dress up well for her first ballet performance. Our fashion ballet star is little bit nervous and scary, and she can not decide which dress to wear, how to make hairdo, and what jewellery to use. If you ever wanted to work as fashion designer to create beautiful elegant dresses, you are on right place. Dress Up Girl For Ballet app will help you to become greatest stylist. Enter to glorious fashion world and accept this cool dress up challenge. Open virtual fashion closet on your smartphone and find few top categories. â€¢	Category with amazing ballet dresses, skirts & costumes. â€¢	Categories with brand new hairstyles, flowers for hair and hairbands. â€¢	Category which contains plenty of colorful tights & ballet shoes. â€¢	Go on and find next sections with some jewellery: necklace, earrings, bracelets â€¢	Set of great backgrounds. Take little ballerina to best ballet fashion studio, and choose the best ballet costume for the girl, then tights and ballet shoes. Prepare your ballet lady for great dance fashion show, save photo and share with friends. Make her to shine like a star in fantastic fashion world. Play this cool dress up game for girls, and teach how to dress well. Build your sense of creativity and clothes design. Mach shoes with ballet costumes, select proper colors and style. Select a hairstyle, bracelets, necklaces and earrings. All necessary ballet equipment is in improvised virtual wardrobe. This is an amazing dress up game, where you can show your art talent. Imagine how you have special boutique with ballet accessories. Make your ballet girl look gorgeous for tonightâ€™s big event. She will dance best she can, everybody will watch her wonderful ballet show, and admire how she look beautiful. Make her look like a princess. If you finished with ballerina girl dressing up, then you have and option to choose and top category with beautiful backgrounds, in a ballet hall with mirrors, in the garden with flowers, in theatre, etc. 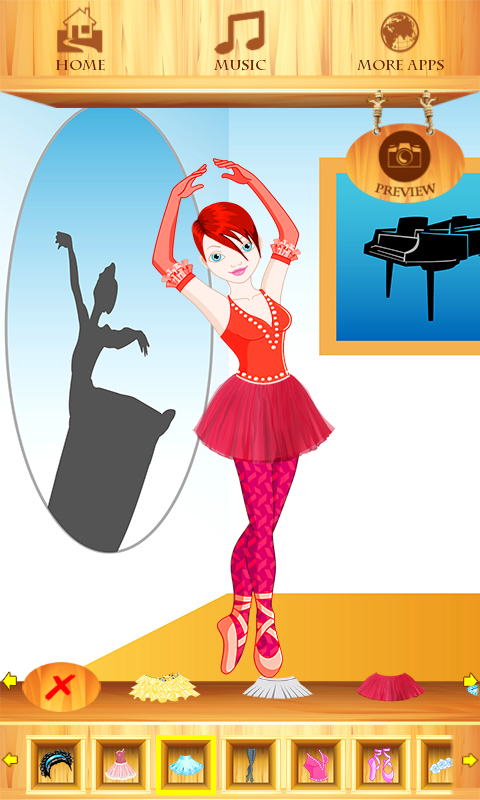 Dress Up Girl For Ballet free game will take you to glamorous fashion world. If you love ballet, music, dance, download app and play the game. You can practice and become greatest fashion stylist, and your work can be one day on cover magazines. At the and you can: â€¢	Save your model, take a photo and show to your friends.